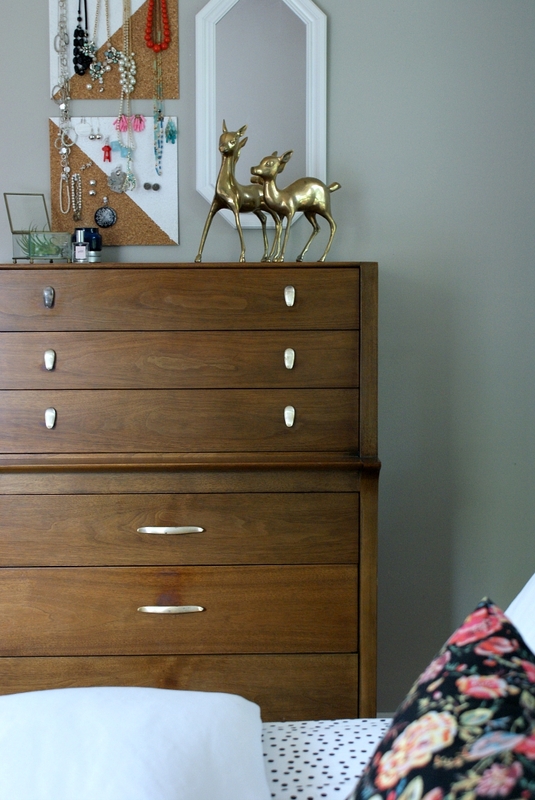 A while back, I started thinking about how to free up space both visually and physically in our bedroom. 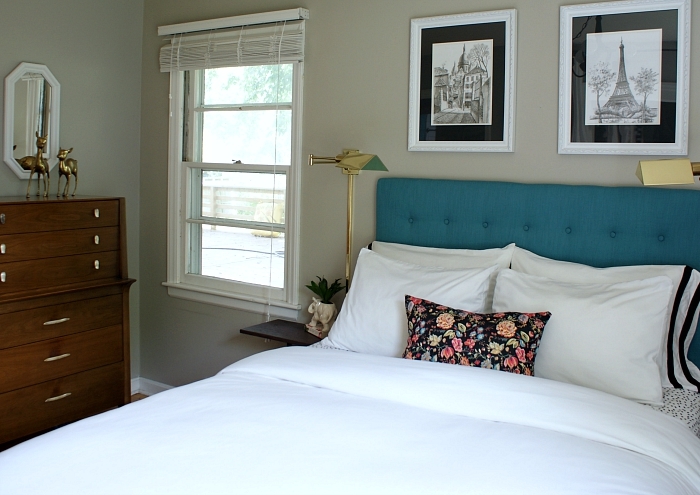 It's a pretty small bedroom, about 12 x 12, so I need to be choosy about what furniture and decor go where and evaluate whether it makes sense in terms of form and function. For example, I didn't want a pile of decorative pillows on the bed because, other than the floor, there's simply no place to put them at night. 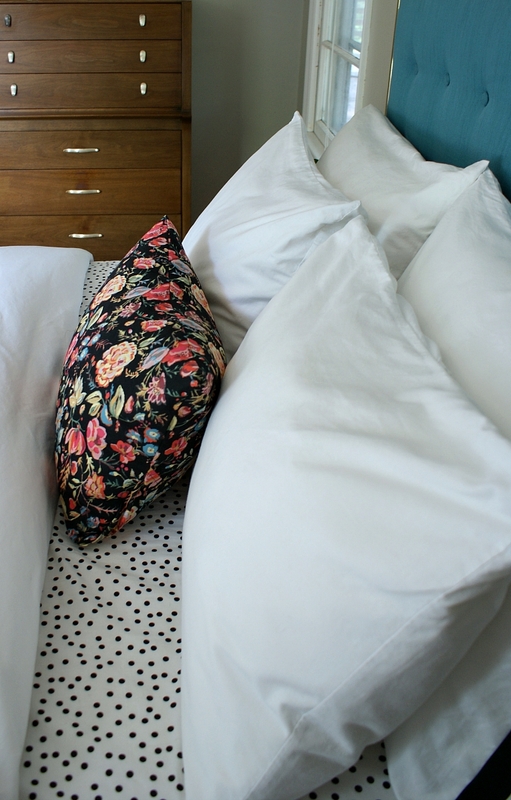 I wanted our bed to be pretty but also realistic and liveable so, all the pillows except the black floral toss one are pillows we actually use every night. 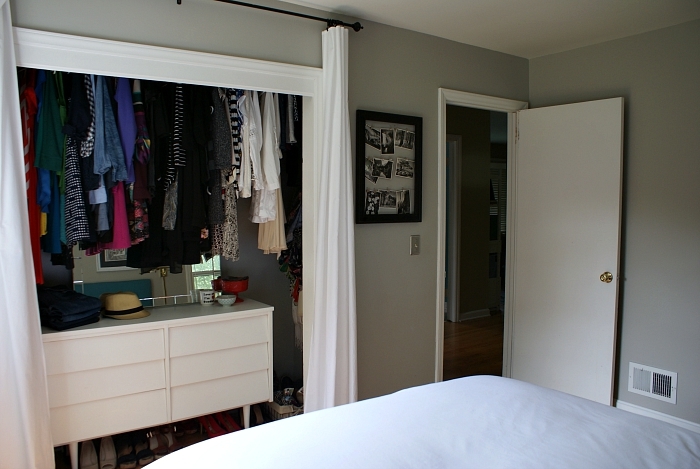 The first thing I did to create more space, or at least the illusion of it, was spruce up our closet by removing the awkward sliding doors and adding more storage. We moved the closet rod up as high as I could comfortably reach and put a shelf above and a mid century dresser below. Taking the doors off the closet and prettying up the inside, opened up the room and made it feel a smidge larger. 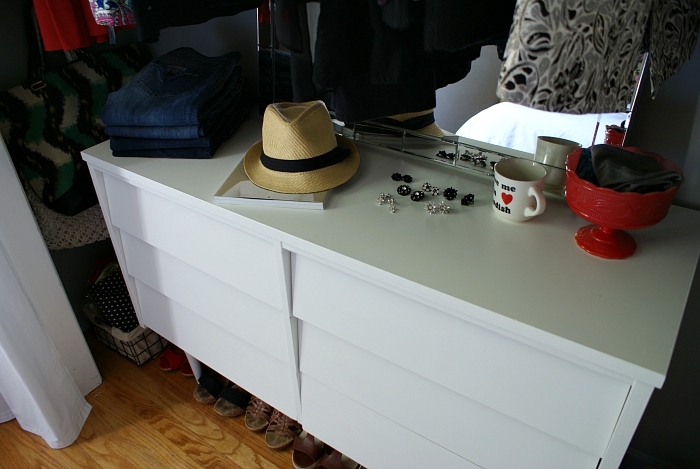 I also like having the dresser because I have an additional surface to set things on when I'm getting ready in the morning. We've always stored Jesse's clothes in the spare bedroom. If we didn't have that option, I think I'd divide the closet down the middle and store our out of season clothes under the bed. 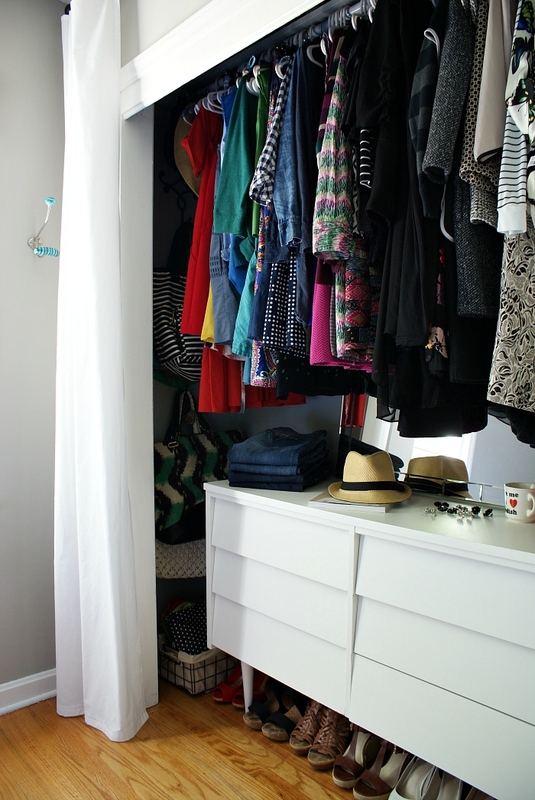 You can read a little more about the closet makeover here. The next area I tackled was the space on either side of the bed. 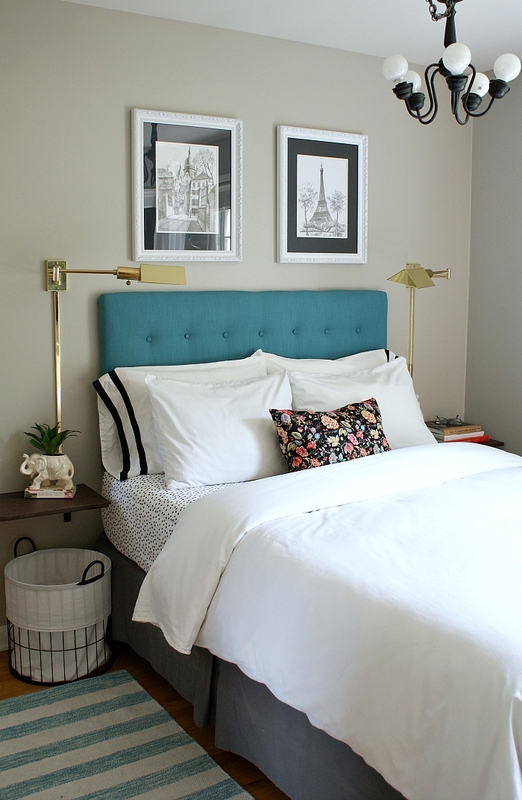 My vision was to replace the bulky lamps with wall mounted sconces and the nightstands with a wall mounted option as well. If you follow me on Instagram, you might have seen my post about scoring these brass beauties. They were crazy cheap, especially compared to the swing arm sconces I had been oggling from Rejuvenation. I like the finish on their sconces slightly better, but for fifteen bucks each, I'm pretty darn happy with mine! After the brass sconces, came the wall mounted nightstands, which we made using old cabinet doors. The drawer in my existing nightstand held a bunch of old t-shirts I didn't wear anymore. So, I donated a few, cut a few up for dusting cloths and stored what was left inside the highboy. Jesse's nightstand drawer was empty except for a pen, earbuds and a dusty copy of Popular Mechanics. Yeah, total waste of space! 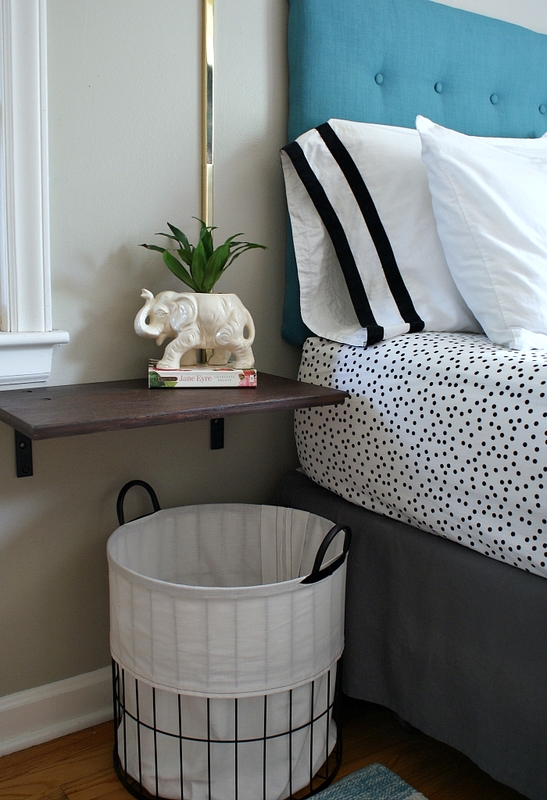 I added a pretty wire basket under my shelf / nightstand which is where I put the floral toss pillow at night. During the winter, I'll probably use the basket to store an extra blanket or two. As you can see below, in addition to space saving changes, we've made a few style tweaks as well. 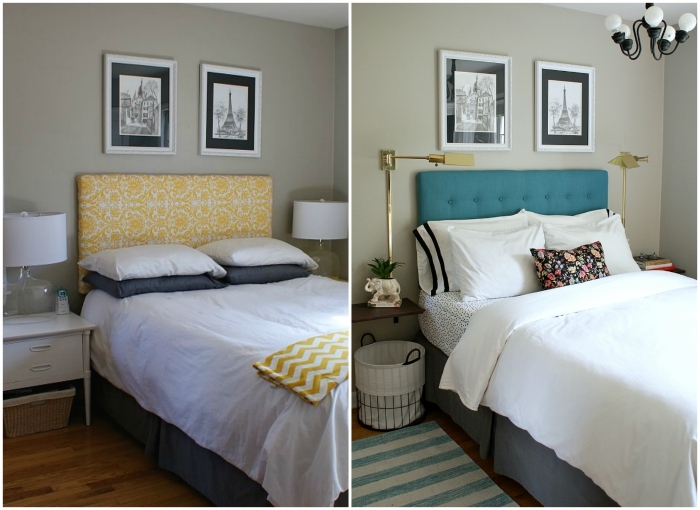 I re-covered and tufted the headboard a couple months ago. And way back last spring, we replaced the generic ceiling light fixture with a mini chandelier from a salvage store. Other than the nightstands and the dresser inside the closet, the only other piece of furniture in the room is a highboy dresser. It's a vintage Drexel piece I bought several years ago from an estate sale. This guy might need to be refinished eventually, and his drawer pulls need re-plating, but he will never go out of style! Thanks, Mary K. - it's a real gem! 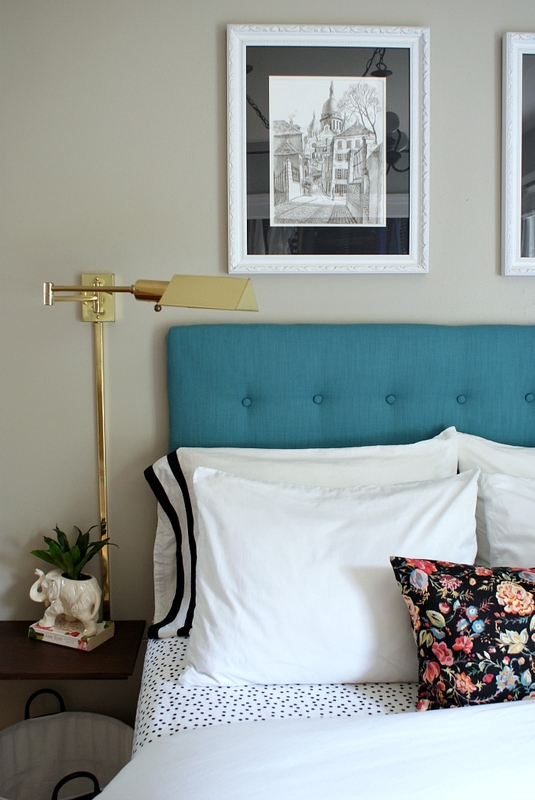 ooh, those brass sconces are so fabulous! And I love the polka dot sheets, too. looking good! Love it! And it looks so much better than some rooms that are humongous. Great great job! That throw pillow is perfect! It makes the room! 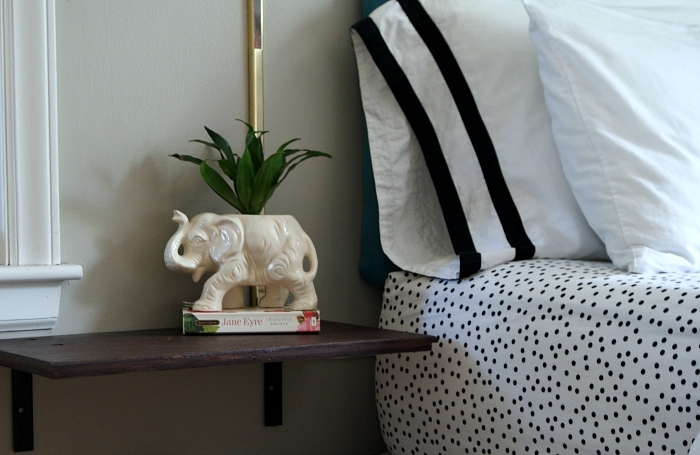 I love the headboard too!